This workshop is FREE to all NMSU students. The workshop will be held upstairs in Room 210 in the D.W. Williams Hall building from 4:30 to 5:30. 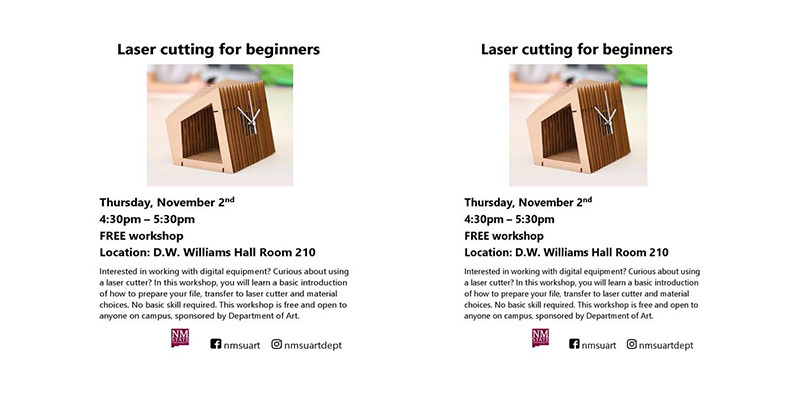 This entry was posted in Event, NMSU Department of Art, Outreach and tagged #digitaltechnology, #lasercutting, #nmsuart, #nmsuartdepart. Bookmark the permalink. Follow any comments here with the RSS feed for this post. Both comments and trackbacks are currently closed. « 1 – Month Residency for MFA Graduate, Madison Manning Coming Up Soon!